American Bar Association members receive free continuing legal education credits through the monthly CLE Premier Speaker Series. Sponsored by the ABA and the Center for Professional Development, thousands of attorneys participate in each month’s complimentary webinar program. It is a tremendous honor to have my program, Lawyer Rankings and Ratings: The Impact on Ethics and the Profession, selected for inclusion, on Monday, October 21, 2013 from 1-2:30 pm Eastern Time. 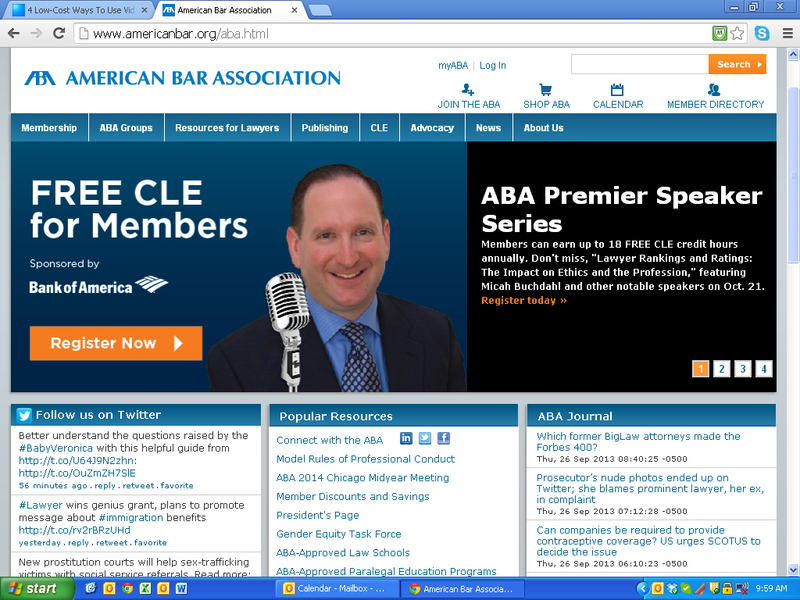 If you are an ABA member, be sure to take advantage of attending this timely and topical CLE. There may not be a bigger “industry” in law firm marketing and business development circles than the continued growth and proliferation of rankings and ratings. The Rules of Professional Conduct and ethics opinions have tried in vain to develop workable ethics barriers and parameters, however, the impact on the profession is significant–from the time and money spent to the permissible uses for promotion. Learn about ratings and their methodologies, and the ethical considerations voiced by various state and national bar associations. From long-time services by Martindale, American Lawyer Media, Best Lawyers and Super Lawyers; to relative newcomers such as Chambers USA and Avvo; and the thousands of other companies that have recognized there is a lot of money to be made in the business of lawyer rankings. Are they helping buyers of legal services make more informed decisions or hindering the profession as a whole? If the program is half as good as our planning calls, the different perspectives from the panel should prove fascinating. As a moderator and panelist, I represent both the perspectives of an ethics attorney and of a law firm marketer. For many years, through my involvement in the ABA Law Practice Division, I’ve authored articles and moderated programs on the subject for Law Practice Today and the biannual ABA Law Firm Marketing Strategies Conference. Steven Naifeh, President of Best Lawyers, represents the “industry”, as one of the most respected attorneys running one of the more respected “players” in the field. He offers an historical perspective and understanding of ranking growth and success, changes in methodologies and strategies. Elizabeth Tarbert, Ethics Counsel for The Florida Bar, provides a point-of-view from the state bar regulatory perspective. Of course, Florida is one of the most active states in regard to attorney advertising and marketing regulation, with more rules, opinions and supporting documentation on what you can and can’t do than pretty much anywhere. My rule of thumb on issues regarding advertising regulation is that if it flies in Florida, you are likely safe just about anywhere else. Between me, Steve and Elizabeth, the panel should provide a healthy debate on a hot button topic. When you throw in elements of the Internet–from social media to review sites–the potential issues and topics of conversation broaden significantly. It should prove to be an ethics CLE that will be anything but boring.